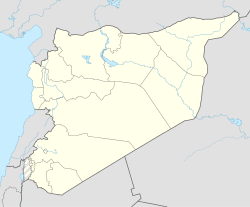 Ras al-'Ayn (Arabic: رأس العين‎) is a village in southern Syria, administratively part of the Rif Dimashq Governorate, located southwest of Damascus. Nearby localities include Yabroud to the northeast, Ras al-Maara to the northwest, and Ma'loula to the southwest. According to the Syria Central Bureau of Statistics, the village had a population of 2,754 in the 2004 census. Its inhabitants are predominantly Sunni Muslims. ^ Smith, 1841, p. 173. Smith, Eli; Robinson, Edward (1841). Biblical Researches in Palestine, Mount Sinai and Arabia Petraea: A Journal of Travels in the Year 1838. 3. Crocker and Brewster. This article about a location in Rif Dimashq Governorate, Syria is a stub. You can help Wikipedia by expanding it. This page was last edited on 10 April 2018, at 20:53 (UTC).